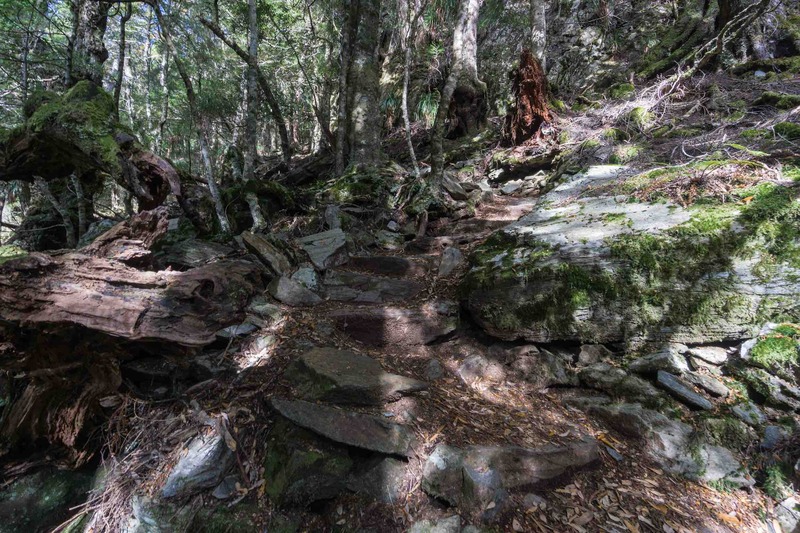 A day off the saddle – a day to make use of the hiking boots that make up 1.2 of the 20 kg. load of “essential” stuff I decided to bring along for my ’round Tasmania bike ride. From my Discovery Parks tent site, I wandered over to the huge kitchen/dining building and made some breakfast. By 9:00 I was over at the Welcome Center/Transit Depot with my ticket and my park entry form – ready to catch the next bus into the park itself. 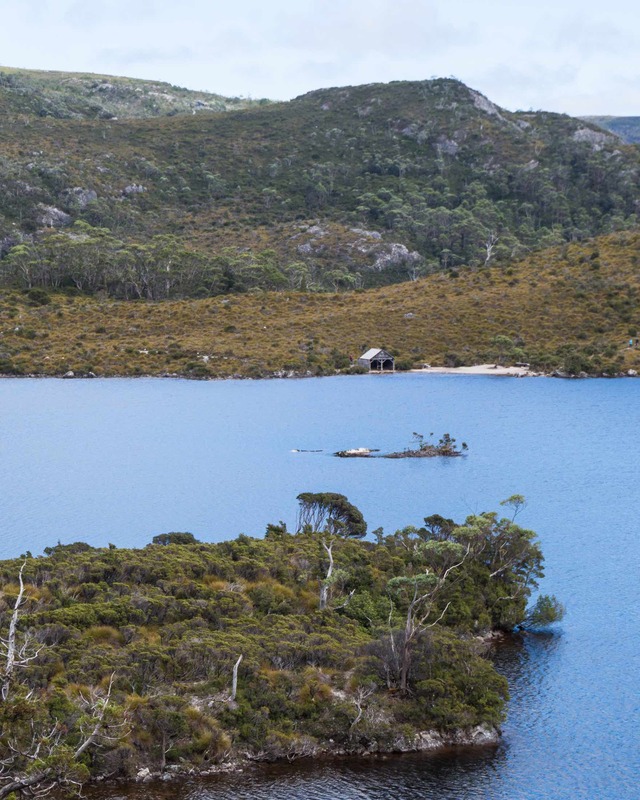 There are a number of stops along the way to Dove Lake, the end of the line. 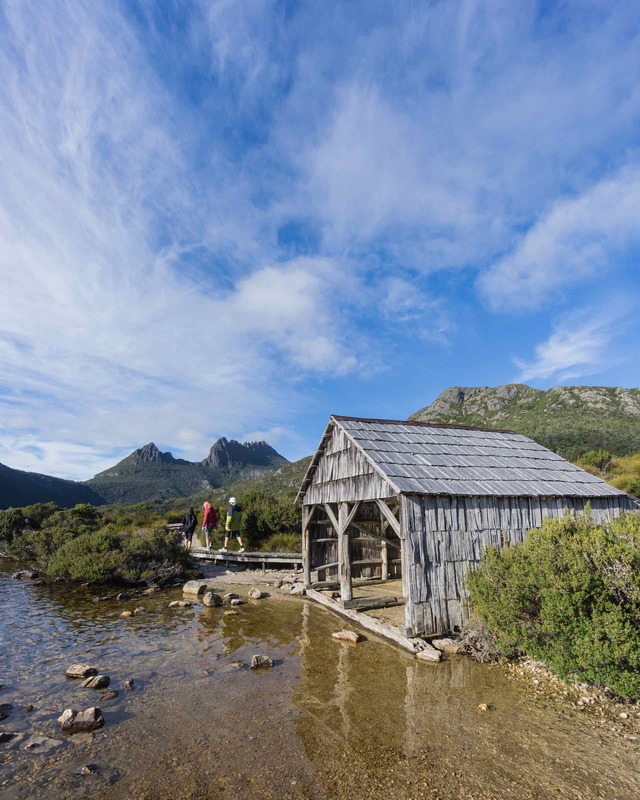 At some of these stops, hikers got off for their choice of day hike. 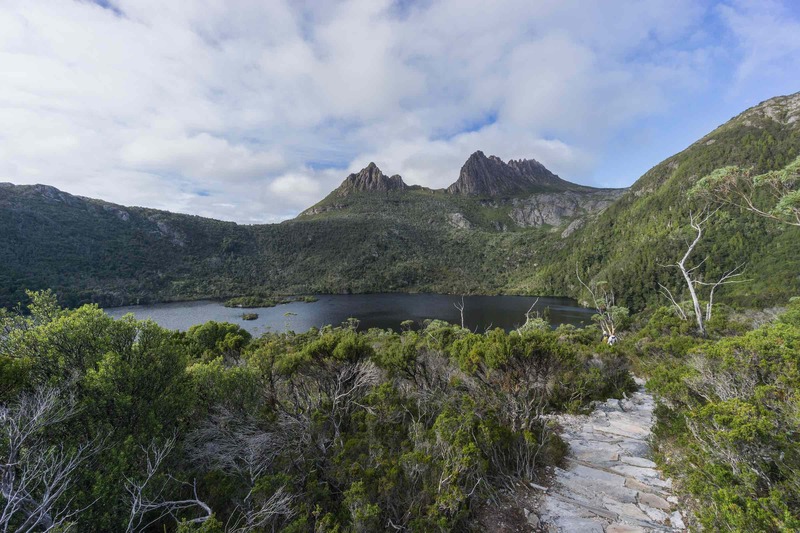 My plan was to walk along the Dove Lake trail and then make my way up to the path going to the summit of Cradle Mountain. The image below sets the scene – it is what I saw after I left the bus and walked across the parking lot to the trailhead. “You are here” the map reads. I would take the right-hand trail and start my walk. 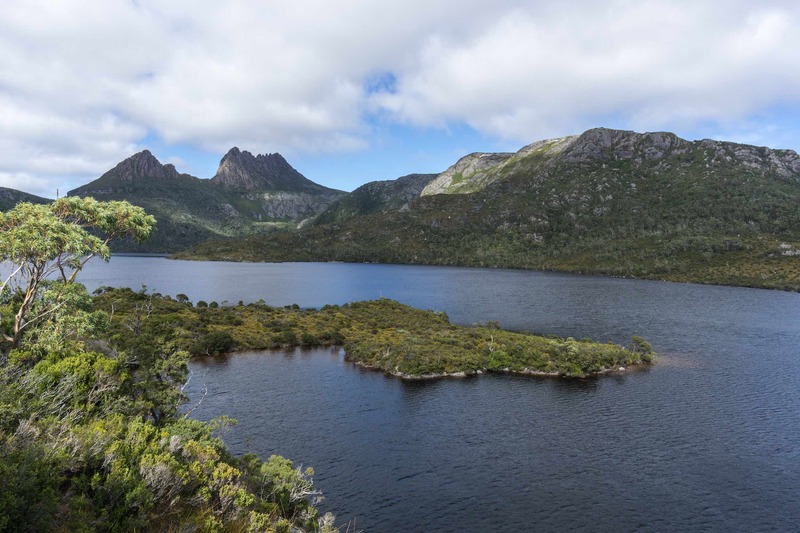 I looked out over Dove Lake and beyond to the series of peaks in the distance. I’d be getting to know them much better from various angles as I walked around the lake! 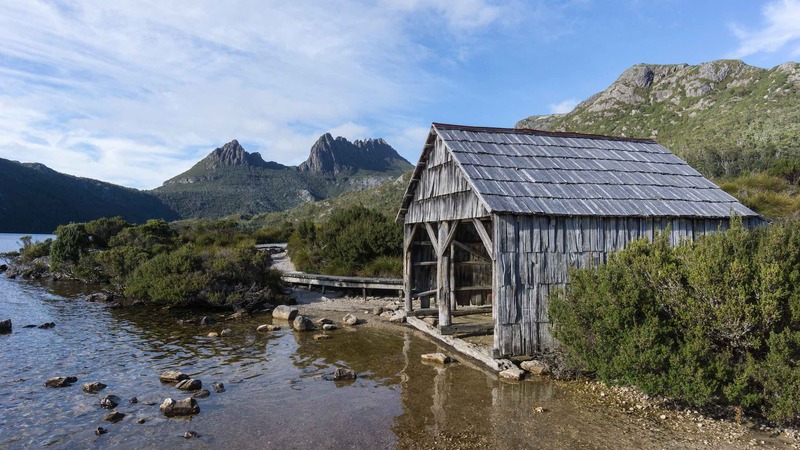 The peaks at the other end of the lake may have been the ultimate objective but first up was the boatshed (built of pine and dating back to 1940) sitting on a gravel beach with the trail passing behind it. I got one shot of it and then waited for some fellow hikers to walk into the image and give it a human element. 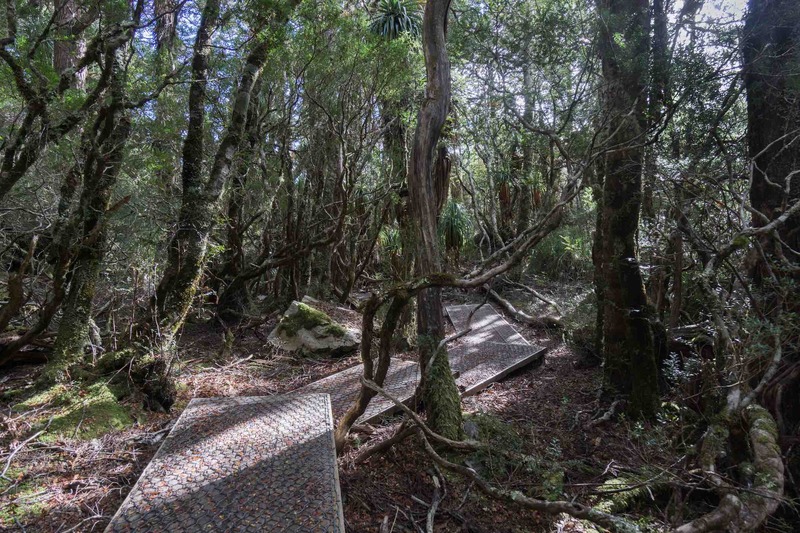 Some of the Dove Lake path is wood boardwalk and some – as the image below shows – is stone. 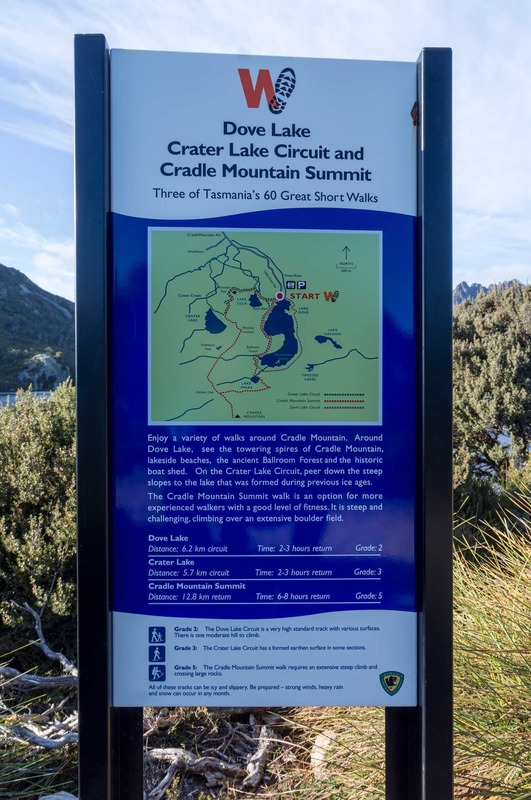 Some stretches have a wire mesh nailed on top to provide better traction for walkers of the eight-kilometer Dove Lake Circuit, clearly the most popular of the walks in the park. 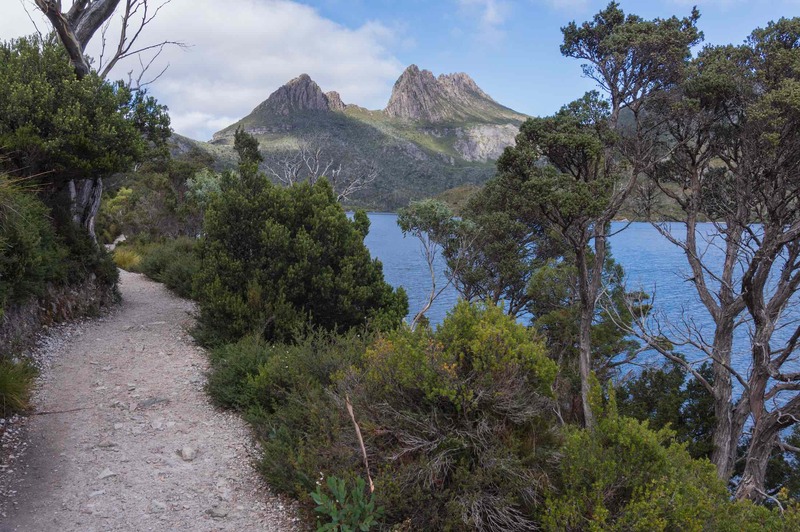 I left the Dove Lake Trail at the south end and started up on the rather steep path to Wilks Lake. 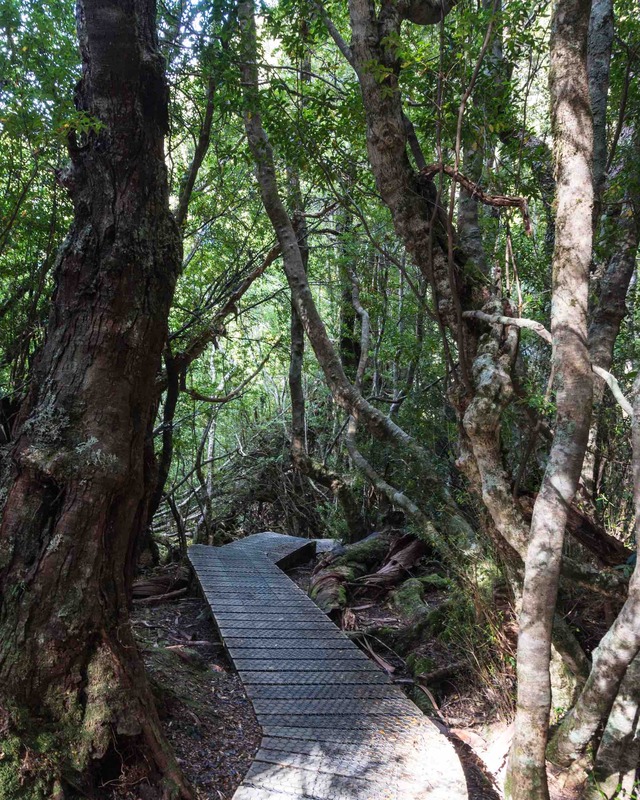 The trail got steeper and steeper and – after an initial section with mesh covered boardwalk to reduce erosion – it also got rougher. 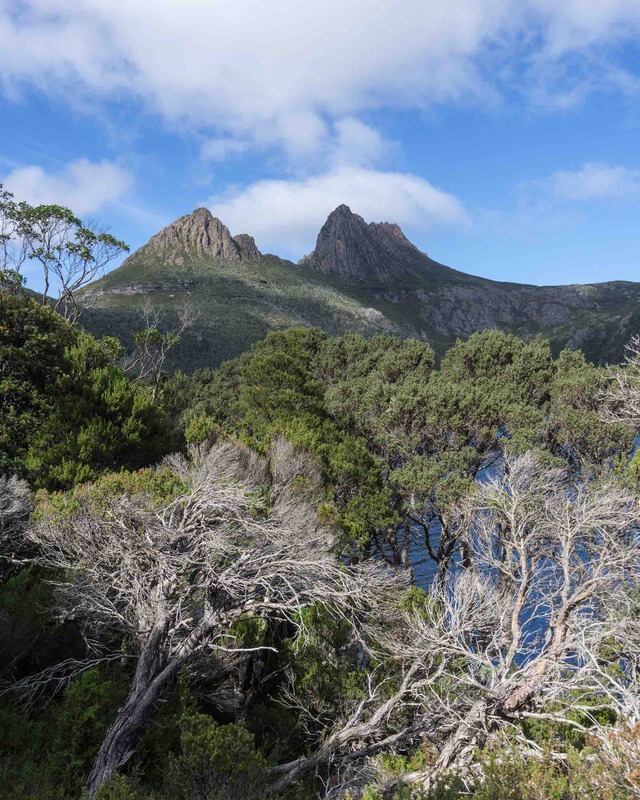 In retrospect, I probably picked the wrong approach for my planned hike to Cradle Mtn. summit. As the map below shows, there is a more gradual ascent that starts shortly after the boathouse. I didn’t even get as far as Wilks Lake before I decided to pass on the uphill scramble. No trekking poles, a bit of a kink in my left knee, and just not enough motivation to “git ‘er dun”! I walked back down the track to Wilks Lake I had just gone part way up and was back down at lake level. 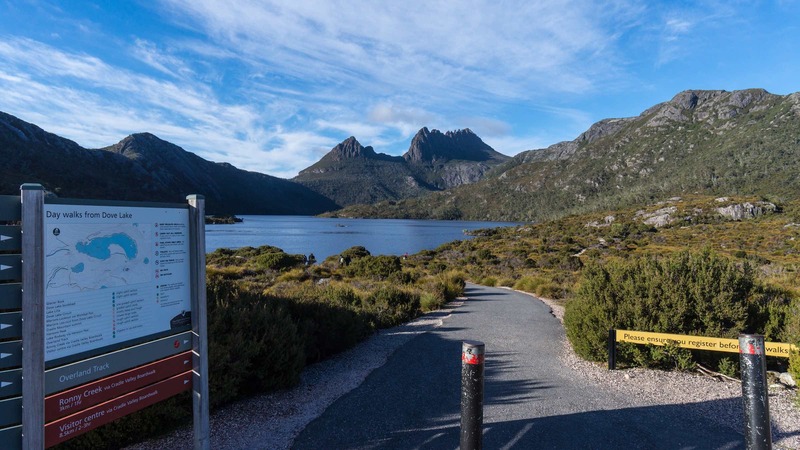 As I walked along the east side of the lake back to the starting point I looked back more than once to take a look at the series of iconic peaks that define the park. The photo below looks over the lake toward the boathouse on the west side; the stretch of the shore with gravel is where it is. 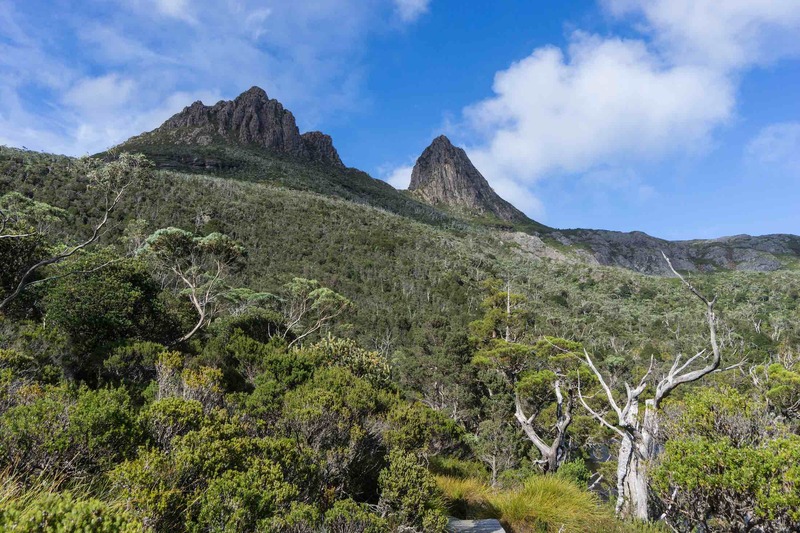 I took this shot from Glacier Rock, a dramatic viewpoint that comes up near the end of the walk if, like me, you have done it counter-clockwise. That is Glacier Rock that some fellow hikers I have left behind are standing on. And here is Glacier Rock again for yet further away; it certainly provides a magnificent vantage point from which to enjoy the views. After a couple of hours, I was back at the beginning. 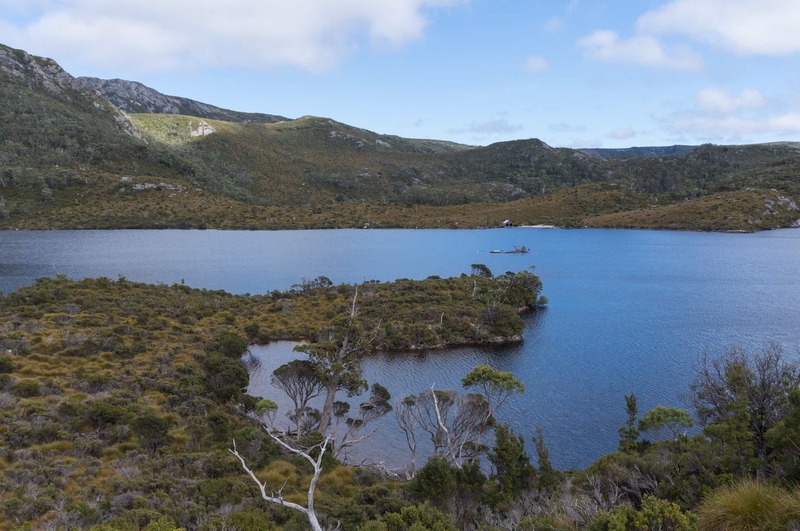 I was feeling somewhat guilty for having wimped out on the hike up to the top of Cradle Mountain – it would have doubled the eight kilometers I walked around the lake and more than doubled the views. 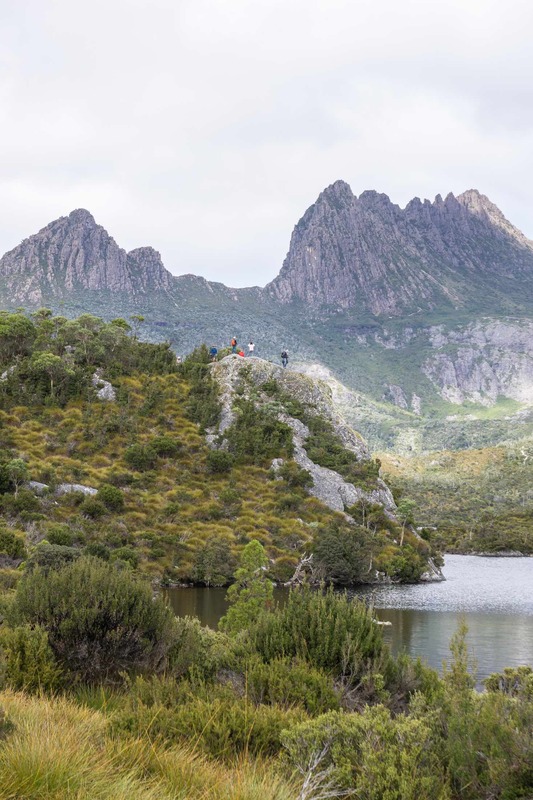 However, the Dove Lake Circuit had been an enjoyable way to spend the morning. As I neared the car park and bus stop area my thoughts turned to lunch at the restaurant attached to the Visitor Center. I’d eventually get back there but I first hopped off the bus for a half-hour visit to the Park Museum. 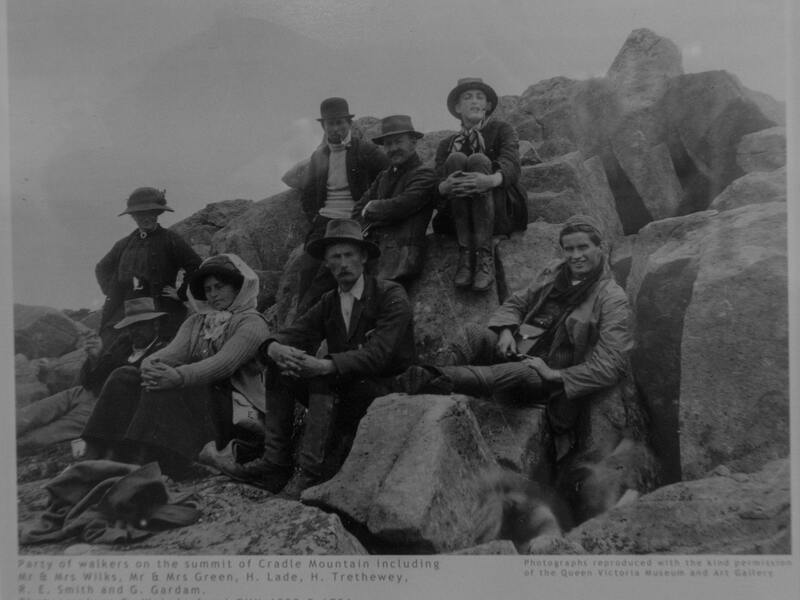 The photo from the early 1900’s of a hiking party on Cradle Mountain summit – no trekking poles in evidence, no hiking boots, but clearly lots of motivation! And then I saw the following recreation of wintertime Dove Lake. 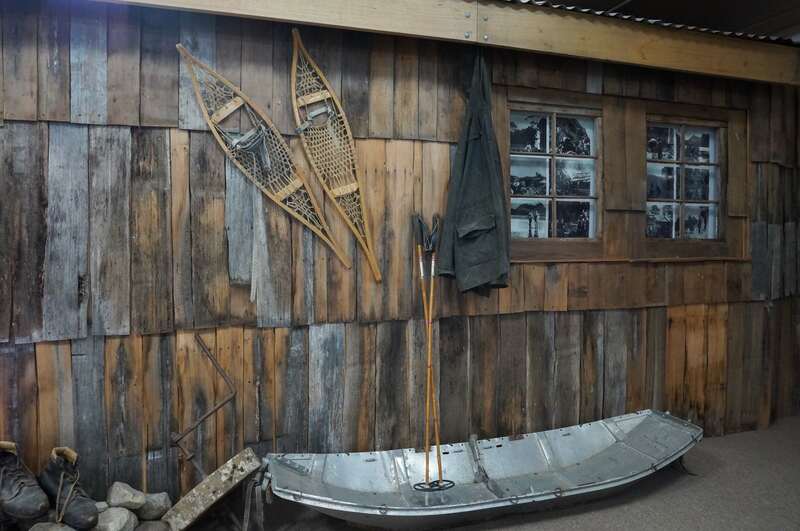 Hanging on the wall was a pair of Algonquin-style snowshoes from the boreal forests of the Canadian Shield! A few days earlier I had seen another object from back home in Canada in a shop in Bicheno – it was a dream catcher, an Ojibwe creation which has been embraced by New Agers the world over as an expression of spirituality. It is fascinating how bits and pieces of cultures from far away pop up in new contexts – not stolen so much as embraced for their ingenuity or poetry. That afternoon some rain would move in and I spent some time in the kitchen/ dining building reading and planning the next leg of my journey. 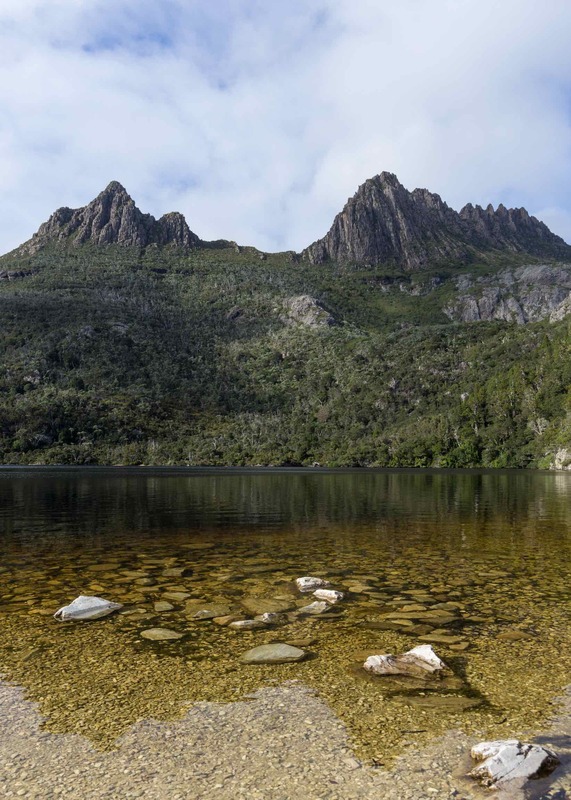 Strahan was the next major destination and I hoped that with morning some better weather would arrive! 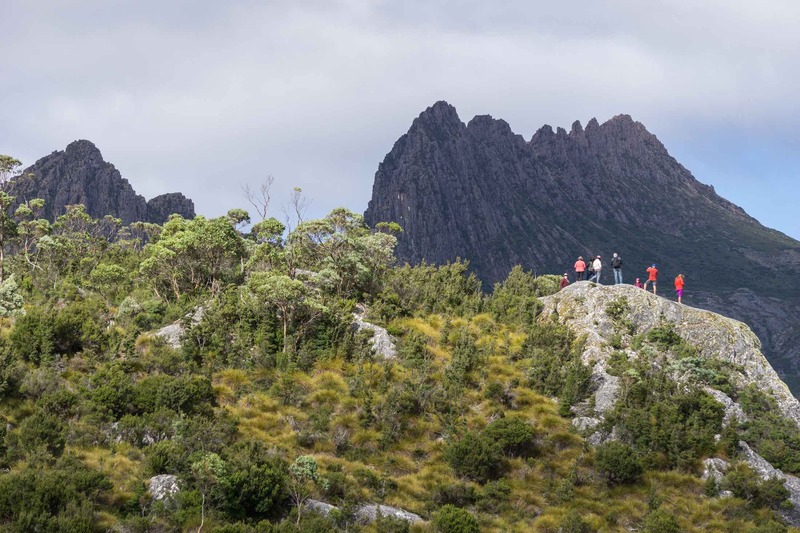 This entry was posted in bicycle touring, hiking/trekking, Tasmania. Bookmark the permalink.